"I would like to thank every one on behalf of the Martin family, the McDonough clan, the class of Q.V. '78 and all who knew and loved Tommy"Electric" Martin. He will be greatly missed. The world has lost THE most unique character ever to dance to the beat of that different drummer. I would also like to propose the idea of a gathering of friends and loved-ones at Walker Park in honer of Tommy's memory...The week end of the 19th of September, 2015. From what I understand, some good old friends will be in town for the Steelers opening home game on Sunday. Please let me know if you think you might want to get together and celebrate the "Life And Times of Tommy P. Martin", my oldest and best friend. Please respond by text , phone , email or smoke signals. 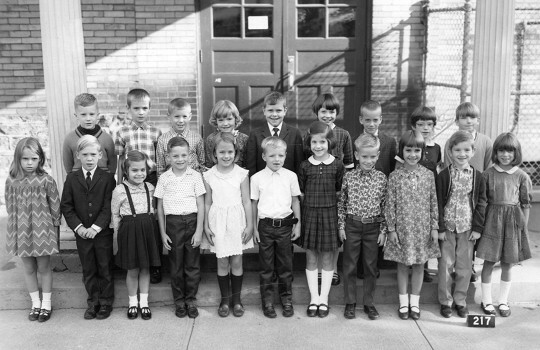 (drums will also be accepted and preferred) Thanks, Bill McDonough 724-554-9579"
Tommy was with many of us going back to the Fair Oaks days; below is our second grade class pic of Mrs Saxon's class...Tommy is 4th from the right on the first row between two hotties...Bonnie and Dawna. Many of us will be there with you in spirit.